Thanks to all of you for convincing my honey!!! The room might actually come together sooner than I thought! awesome! Did you get it in beige or white?? I love your taste, the Sofa is awesome, be sure to post before and afters on the room you are going to place this in! Also, thanks for the infomation on Farmhouse Wares! I love that store and look forward to getting many things from them. Today I ordered the Cider Carafe, I can not wait to get he megssage board and the place cards you like! I would love you be a follower on my blog too, www.happilyeverafterhome.blogspot.com You were my inspiration for starting my blog. Thank You! Soooo jealous! I want that sectional!!!! Yay! Please let me know how you like it!! 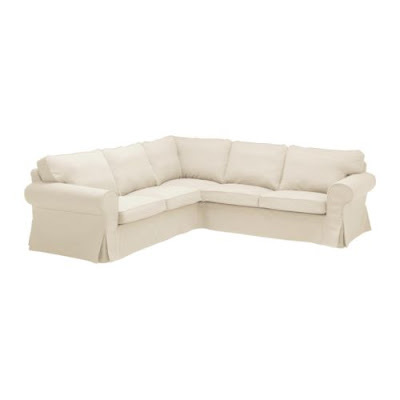 I really want to purchase the exact sectional, but I have a son with allergies and am concerned about the feathers ... I love your blog, btw. Like you, I am ridding myself of most of the 'color' in my house and am going neutral. Well, trying to anyway ... :) Good luck with your room! I can't wait to see it.